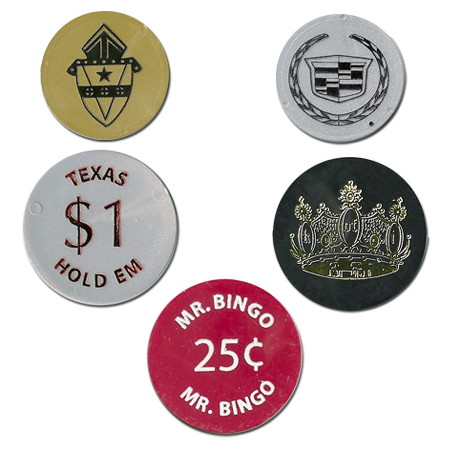 Our Plastic Game Tokens are imprinted with any one-color design you choose on both sides of the pieces. You can also imprint a different one-color design on either side of the Game Tokens. Plastic Game Pieces are available in fourteen different colors: Black, Blue, Bronze, Glow-in-the-Dark (add 4 cents/token) Gold, Green, Lime Green, Orange, Pink, Purple, Red, Silver, Yellow, and White. Nine imprint colors are available (see below). For Glow-in-the-Dark, add 4 cents per token. $30.00 (V) setup for text designs on both sides of token (no logo). Includes text-only logo and up to 3 different text designs. Black, Brown, Metallic Blue, Metallic Gold, Metallic Green, Metallic Red, Metallic Purple, Metallic Silver, and White.